One of only two known surviving examples of a scarce chart. An Outline Chart for the Purpose of Marking off the Track of a Ship. 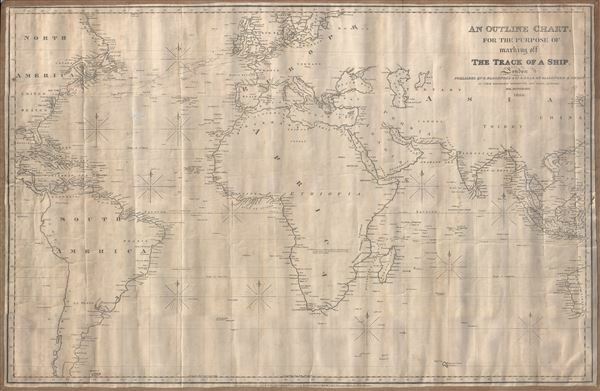 A large 1846 blueback nautical chart or maritime map of the world by Robert Blachford. Centered on a large and prominent Africa, this map covers most of the world excluding the Arctic climes from roughly the Orkney Islands to the Falkland Islands and from Yucatan (Mexico) to Borneo and Western Australia. Blachford intended this map for marking the route of a ship along the more common maritime routes - to the Americas and around Africa to India and the East Indies. It notably does not include the Pacific, an area in which Blachford had little interest. Notations in pencil indicate that this chart was used to mark off repeat voyages between England and the Americas, specifically New England and the West Indies. This chart was first published in 1829 by Blachford. No known examples of the 1829 first edition have survived. The presented example dates to 1846 and was published in the final year of the Michael Blachford - James Imray partnership - presumably just prior to Imray's buyout of Blachford. Like most of Blachford's maps this chart is extremely rare. One chart the same name is held at the National Maritime Museum at Greenwich (G201:8/8(1)), however, it seems to be a marginally different chart covering a larger area. Robert Blachford (1775 - c. 1852) was an Irish maker of blueback nautical charts active in the middle part of the 19th century. Compared with many major nautical chart publishers in London, little is known of Blachford. Around 1802 he married Elizabeth Moore, the daughter of the John Hamilton Moore (1738 - 1807), a prolific producer of navigational textbooks and nautical charts. Blachford must have been introduced to nautical chart making by Moore, but his partnership with the latter was short-lived and dissolved two years later in 1804. By 1805, Blachford had established his own firm located at 137 Minories, London. Initially, Blachford's business seems to have been poor and he produced charts only sporadically until about 1808, when he opened a new shop at 114 Minories. From this location he published about 20 - 30 known charts primarily focusing on the North Sea and the Baltic. Most of these were based on Moore's earlier work but fully re-engraved by Samuel Stockley (who also, incidentally, engraved for William Heather). With such a meager publication history, it is unsurprising that Blachford declared bankruptcy in May of 1819. Shortly thereafter Blachford was back in business and partnered with William Lane. This partnership was also short-lived, issuing about 15 charts before being dissolved in 1821. Around 1827 Blachford again reappeared, this time at his old stomping ground Minories (116), an office he would maintain for the next 25 years. Robert this time partnered with William Blachford, presumably a relative though the relationship is unclear. The firm issued numerous charts focused on the British coastal trade. The rough and damp conditions synonymous with this trade determined that few Blachford charts from this period would survived. Around 1835 Robert and William Blachford retired, passing the business on to Michael Blachford (1807 - 1889), who partnered with the stationer and draftsman James Imray. The Imray-Blachford partnership proved potent. Athough new to the field of chart making, Imray was hard working, intelligent, and ambitious. By 1846, Imray had bought out Michael Blachford and was on the rise to being the largest and most prominent maker of nautical charts in history. Good. Some soiling, cracking, and age toning. Pencil marks relating to navigational use - could be erased at buyer's discretion. Original blue paper backing and linen edging.